When disaster strikes and you find yourself facing unexpected, significant damage to your home or business, it can be overwhelming. You don’t know where to call first, but safety and containing the damage are probably the main things on your mind. 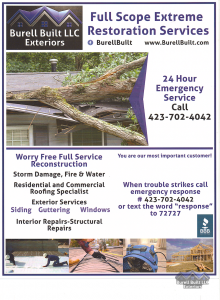 If the worst occurs, call your trusted team at Burell Built Exteriors at (423) 702-4042. We are available 24-hours a day, so you don’t have to wait for the vital assistance you need. 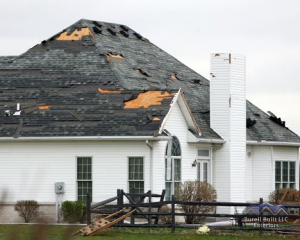 Whether it’s storm damage or a fallen tree that has caused a leak in your home roof, or a car crashing through the front of your business, we are here for you! Let us assist you throughout the insurance claims process for your Knoxville, TN or Chattanooga, TN home or business, and we’ll get you back to normal (or better) as soon as we can! We have over 20 years of experience in the commercial and residential roofing industry, and with that expertise comes the ability to act quickly and accurately to ensure that we’re taking the best care of our customers that we possibly can. With our strong background in all things home exteriors, we can also help you navigate the process of filing an insurance claim and working with your insurance adjuster. Our primary job is to be there for you, our customer, and to quickly mitigate further damage by containing whatever issues are present when the situation occurs. From there, we can thoroughly evaluate the situation, and recommend potential courses of action, including choices of materials for repairs or replacement efforts. Every one of our highly-trained contractors will go out of their way to communicate with you throughout the entire process, and we’re always available for questions or concerns along the way. And while you’ll see “exteriors” in our company name, keep in mind that we can also take care of structural and interior damage as well. This means that you can make a single phone call during your time of need, and reach a whole team of qualified roofers and contractors to help from beginning to end. So if the siding is damaged, interior drywall is cracked, windows are broken, gutters have come down, or the whole roof needs to be replaced, we can handle it with confidence and quality workmanship. Don’t wait to call us for prompt assistance with insurance claims and restoration services for your Knoxville, TN or Chattanooga, TN home or business. We’re here for you! Updated on September 16, 2016 at 2:49 pm by Burell Built Exteriors.